Sunshine Coast Triathlon – My Happy Pace! It was not always so! When I was at school I did a lot of sport but none of it conventional school sports. That might have had something to do with the fact that I have ZERO eye hand co-ordination and cannot hit, catch or throw a ball. As we had to do at least one winter and one summer school sport I did swimming and cross country but I was not very good. I did not like to practice and as most of my other sports did not involve endurance I could not run very far without stopping. Swimming was bit better (natural talent) but running…. Oh I hated it! The races were 4 km every second Wednesday afternoon at a different course. I would show up, run/walk/wheeze then go home muttering and moaning that I was not a runner. After school I did nothing for many years. I loved walking and rollerblading and did that a lot while overseas. When I returned to SA I figured I really needed to do something again. I took up paddling (canoe and surf ski) I was unfit and always last but it was fun. The people there were all very fit though and spoke of running and races and things. It was infectious and I decided I was going to enter the Spar Ladies 10km race. My first run was not good. I managed less than 1 km before I turned around and walked back home. Thankfully the race was over 9 months away. I remember a conversation with 2 girls at the canoe club, both multiple time Comrades finishers. I was seriously impressed and mentioned that I had just started running, that I was hoping to run the Spar ladies, but it seemed sooooo far and I doubted I could do it. They just laughed (thankfully not unkindly) and told me that that was how it started. First a 10km, then a 15 and so on. My words were “I will NEVER EVER go further than 10km”. At that stage I seriously doubted I would even make that. Their parting words were “we will see”. Well, they were right. I did a 10km, and signed up for the Knysna half marathon in 2005. 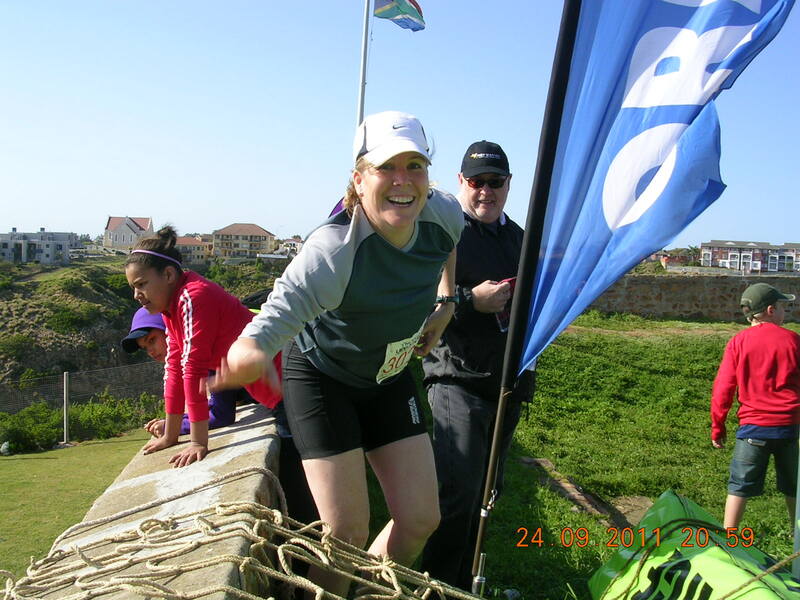 In the end I did not do it that year due to injuries, but I did Two Oceans Half 2006. 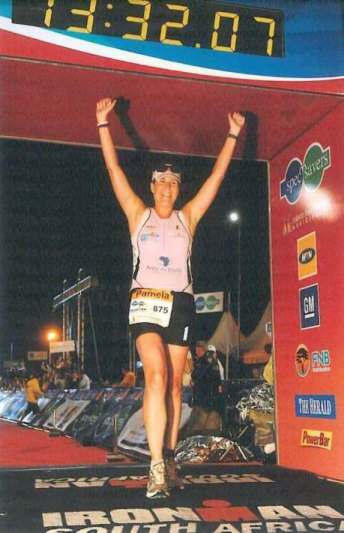 Then in 2007 I completed my first Ironman. Yes, I had only done 1 half marathon, and a lot of people did not think I would manage. In fact a couple of them have come to me since and said they would have bet their house that I would not have finished. Well, finish I did. I managed to squeeze in a few minutes before the midnight cut-off. Since then I have run quite a bit more. I have done Ironman again, taking over 3 hours off my previous time. I have competed in a quite a few triathlons and open water swims and have recently gotten into trail running. I love it! I am always enthusiastic and positive when somebody wants to try something new like running or triathlon. I am a firm believe that if I could finish an Ironman then just about anybody could. I was not athletic, I was not a runner, I was not a triathlete. I did not even own a bike. I would probably be last, but I knew that I would finish it and that is what counts. For people that are just starting out with running, my main bit of advice. Take it slowly. Walk when you need to. Look around. Keep it fun. Do races or something for the social aspect and so what if you come last – somebody needs to. More often that not it has been me. Mr OL likes to joke that I get full value out of my race entry fee. But most importantly just get out there and do it! And for the girls – get a good sports bra. When I started the one I used was too tight, and I could not breath. Except I did not know it was the bra, I thought it was just because I was that unfit. Tight is not always better –support is what counts. Sunshine Coast Triathlon 2009 – 3rd lady out the water and 6th lady at the finish. I was out for coffee (read orange juice) on Saturday morning and we were talking about 2009. She was saying that it was a non-event year for her and I agreed. I felt like I have not achieved much this year – especially compared to other years. And then I actually thought about it. What the HELL was I thinking – this has been a huge year for me! Firstly sometime last year I discovered I actually quite liked cycling – who’d have thought! Then in January I realized I more than quite liked it I was thoroughly enjoying every minute of it!! This helped a lot with the Ironman training! That brings me to point number 2. I completed my second Ironman. This time I did not feel like I was faking it and was very proud of my finish. I trained hard and enjoyed it. Even though it was an absolute cooker, nearly 40ºC on race day and at one stage I was questioning my sanity I loved the race. 13hours 32 minutes later – I will now proudly say I am an Ironman. After the first one in 2007, I was bit embarrassed to say I was an Ironman. I finished in 16hours 36minutes but I really could have put more of an effort into my training. I kind of felt that somehow I was not really worthy to say I had done one. Doing a second one and doing it well proved that the first one was not just a fluke. Sports wise I had a lot of personal bests. Not only did I have a PR in Ironman of over 3 hours but I also had a PR in every other distance I entered. Who knew that training worked! In the 21.1km I managed to get under 2 hours which I was very pleased about. In the 10km I managed about 54 minutes and in the Olympic Distance not only was I 3rd girl out the water, do a 54 minute 10km, come 6th girl over all but I also managed to finish it in under 3 hours. Happiness is! Also in April I graduated – I FINALLY received my degree. A Bachelor of Commerce in Tourism Management! Yes it took a while but I did it correspondence, I paid for it myself and I finally got it. Whether or not I will ever work in tourism again is another question. But at least I got the degree. Then the BIGGIE, on the 16 June I found out I was pregnant! The baby is due on the 18 February! And I guess that is pretty much it. So it looks like the 1st 6 months were a lot more eventful than the past 6 months. I am very excited to see what (and who) 2010 brings. It should be a good year! 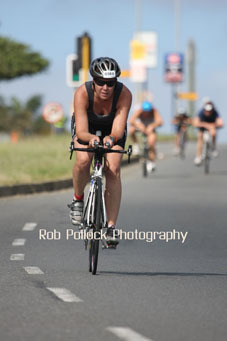 I finally found the photo’s from the Sunshine Coast Triathlon. I knew they had been taken by Rob Pollock Photography but up until now they had nothing on their site. I also knew that they were up in a shopping centre in East London, a little bit too far just to look at photos. But, woo hoo they are now online. Well it was woo hoo until I found the photos of me!!! 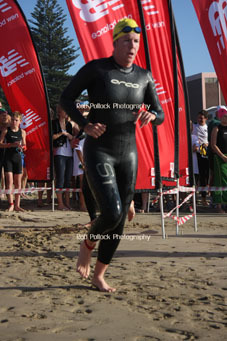 Why is it that I do my best time ever in a 10km EVER and yet in the photo’s it looks like I am walking!!!! I was not walking, I promise. Also why is it that I just look like crap in all my “action” shots! I will never be that cute little girl that looks hot while competing. I will always be that girl that just looks hot (as in about to die from heat exhaustion) while competing. This is the first photo of me on my bike, I am pretty happy with it. At least it looks like I am going forwards. 3rd Girl out the water! I am NOT walking - dammit! So I might be freewheeling?? It’s funny, these photo’s are taken by a Pollock, because lately the way most people seem to have stumbled onto my site is because of that post I did about the Jackson Pollock picture our art class was inspired by. No wonder I thought I was going to die on some of those ups! This is a profile of the cycle route from the triathlon on Sunday. Look how it starts. I suppose at least they don’t go on for too long.